India Calling: A prodigal returns to the motherland. The official Indian calendar is like a box of bitter sweet candies. Just when you feel you have had it with the Indian bureaucracy, a government holiday pops ups on the calendar, thanks to India's secular and multi-cultural constitution. Of course, the lost days also cause much anguish when you are running on strict deadlines, but a bit of proactive planning provides you with plenty of long weekends to enjoy India's many vacation spots. India's cities are fairly well connected by air now. Flights to most Indian cities take less than 2 hours and cost less than $150 each way (even if you book a day or two in advance). The end of January brought a long weekend thanks to Republic Day. I had little desire to waste it hanging out in Mumbai. 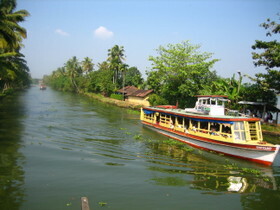 The perfect weekend, I thought, would be to float around Kerala serene backwaters on a house boat. I dialed my good buddy Ranga (college nickname inspired by a bad bollywood song) in Cochin and asked him if he could use his good offices to book a houseboat for me. Good old Ranga is so wired in Cochin, he can even find you a wild Kangaroo as a sparring partner if you are up to it. He found one that belonged to a friend (the boat, not the Kangaroo) in less than 2 hours. He also managed to convince his wife to let him get away for the weekend. Now, there were two of us. Then another old friend popped up into the scene. He's a high school buddy who's on a long sabbatical from his California job at HP. He's been drifting through various parts of India on a voyage of self-discovery and had recently docked in Cochin. We will call him the 'Drifter' for now. Mr Drifter is usually good company till you allow him too much airtime to express his views on life and philosophy. Like any self-respecting Bengali, he is a prodigious reader and has an expert opinion on everything under the sun. Fresh from a yoga course in Goa, he was in a reflective mood and gave us a long discourse on the benefits of Yoga, the benefits of introspection and leading a balanced life. It all made sense as we languidly floated through the the silent backwaters, against the backdrop of a spectacular sun set. 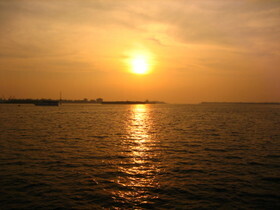 The sun was slowly sinking into river like a reddish orange orb of fire being consumed by the river God of Alleppey. We were quiet for a moment, savoring the view and mulling over the wisdom recently acquired through the Drifter's discourse. However, the moment didn't last long. The juvenile in me re-surfaced soon enough and I quipped that we were all sounding a bit like the California Yoga Granola girls looking for spiritual Nirvana in India. That killed it, right there. There was a bit of an awkward silence as we looked at each other and we all just broke down laughing. We had a full moon that night that lit up the waters around us creating a surreal view of the river around us. 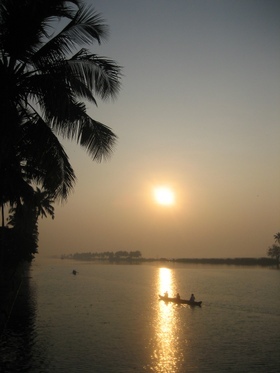 The backwaters can be romantic or very calming, depending on the company you keep. While I enjoyed the company of my buddies, I couldn't help thinking that it would have been lovely to be there with my lady friend in NYC, alone. 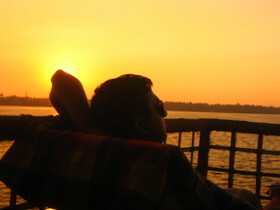 I have also same opinion that the backwaters can be romantic or very calming, depending on the company you keep. Seems you had a great time in Kerala. Well, how many days did you sepnd here in Kerala? Juha is a Fin whos; been living in Asia and South America for many years. Currently in Brazil, he write about lifestyle management and technology. The authoritative blog on Netflix by my good friend Mike Kaltschnee.